Morgan James Publishing, 9781683500094, 318pp. 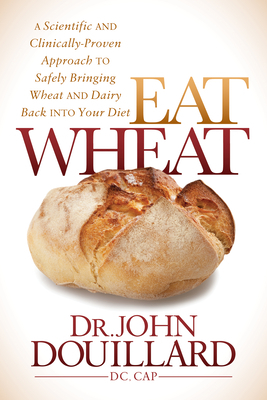 Dr. John Douillard, a former NBA nutrition expert and creator of LifeSpa.com, and author of six health books, addresses the underlying cause of the gluten-free epidemic. Eat Wheat explains how a breakdown in digestion has damaged the intestinal wall and leaked undigested foods and environmental toxins into the body's lymphatic system, causing "grain brain" symptoms and food allergies. Although eliminating wheat and dairy from your diet may help your symptoms, it is a a temporary solution. Eat Wheat addresses the root cause: the inability to digest well and break down harmful pollutants and toxins that can lead to more serious health concerns. Dr. John Douillard, DC, CAP is the creator of LifeSpa.com---the leading Ayurvedic and natural health website. He is the former Director of Player Development and nutrition counselor for the New Jersey Nets NBA team, author of six books, a repeat Dr. Oz Show guest and featured in dozens of national publications.